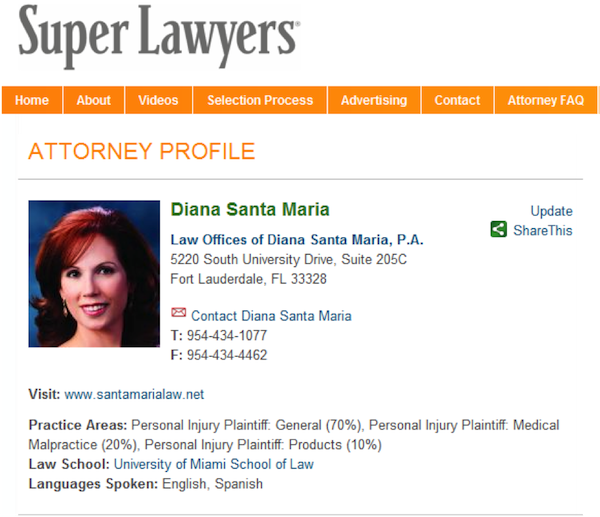 January 2013 Diana Santa Maria was once again selected for inclusion in Super Lawyers of South Florida for the sixth consecutive year. "Super Lawyers "names Florida's top lawyers as chosen by their peers and through the independent research of "Law & Politics". "Law & Politics" performs the polling, research and selection of "Super Lawyers" in a process designed to identify lawyers who have attained a high degree of peer recognition and professional achievement. "Super Lawyers" is a comprehensive and diverse guide to outstanding attorneys, representing a wide range of practice areas, firm sizes and geographic locations. Five percent of the lawyers in Florida are named "Super Lawyers".